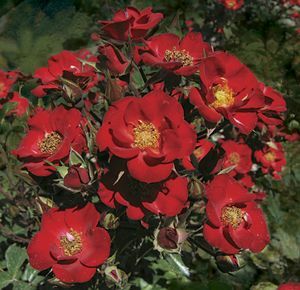 A long-lived rose that blooms late into the season, this scarlet red polyantha will be covered with clusters of flowers creating a spilling effect that would look great in a rock garden and wonderful as a small weeping tree! Red. Bright red orange. None / no, mild fragrance. 5 petals. Average diameter 1.25″. Small, single (4-8 petals), cluster-flowered, in large clusters bloom form. Blooms in flushes throughout the season. Height of 18″ to 2′ (45 to 60 cm).